Over $1,800,000 Given in Referral Rewards!!! For every person you refer who completes a System Pavers project, we’ll send you $500 check. 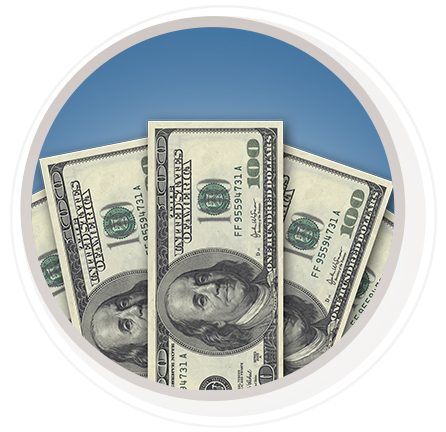 There is no limit to the amount of $500 referral rewards you can collect. Enroll in My SP Referral portal to begin referring and tracking the status of your referrals. 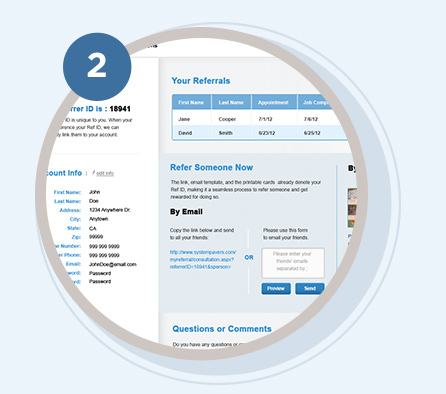 On your profile page, you can view all of your referrals and their current status. You can also refer your friends, family, and neighbors by using the email form on the page or by printing out your personalized cards and handing them out in person. System Pavers Referral Program- SP Refer 5 2017-2019. Recently, you chose System Pavers to add enduring value, functionality and lasting beauty to your home. We sincerely thank you for giving us the opportunity to create your new outdoor living space. We hope that you are absolutely thrilled with your results, so much so, that you’ll consider referring us to your family, friends and neighbors. To encourage that, and as a thank you for your kind recommendation, we would like to introduce to you our new referral program—SP Refer 5! If five of the people you refer to System Pavers for a consultation result in completed projects, we will refund you the entire purchase price of your last System Pavers job—up to $10,000. If you choose to participate, when your referrals call us, make sure that they clearly advise us that they are calling us in response to your recommendation. Your referrals can also mail in referral cards that can be obtained by logging on to www.SystemPavers.com/Refer5 or you can call us at 877-793-7283 to order referral cards. As always, if any person you refer completes a System Pavers project, you will receive a $500 check. If you are interested in participating, please familiarize yourself with the following terms and conditions. Of course, if you have any questions, please call us at 877-793-7283. You MUST be a prior System Pavers customer, your project(s) paid in full, to be eligible to participate in this promotion. System Pavers reserves the right to verify the legitimacy of a referral. For example, if the referral’s name and address is already in System Paver’s system, that person won’t be considered a new referral by you. If two or more people refer the same person to System Pavers, System Pavers will determine who referred the customer first. If that can’t be determined, then the credit will be rewarded to both parties. To qualify, the referral must (1) meet with a System Pavers’ design consultant within 30 days of the referral to qualify, (2) sign a contract with System Pavers within 1 year of the referral, (3) have a contract price of at least $2,500, and (4) complete their project and be paid in full during the promotional period: May 1, 2017 through April 30, 2019. Since System Pavers relies on many forms of advertisement (TV, radio, newspaper, event, etc.) prior to the first appointment with System Pavers, a referral must clearly advise that they are calling us in response to your recommendation. Please allow 4-6 weeks after a referred customer’s project has been completed and paid in full before the $500 referral check is mailed to you. Please allow 4-6 weeks after the fifth referred customer’s project has been completed and paid in full before a refund check of up to $10,000 is mailed to you. A referral is per address; not per owner or inhabitant. Referral entries that are lost, late, illegible or incomplete for any reason will not be eligible, and System Pavers reserves the right to modify, suspend or terminate this promotion at any time, without notice, and to disqualify any entry in good faith. System Pavers has the right to verify and disclose referral/referee information. System Pavers can choose to pay a winner their referral fee or refund by applying the money against any balance due under a contract the winner may have entered into with System Pavers. Liability for any federal, state, and local taxes that may apply to referral fees paid are the responsibility of the referee. Any required tax reporting forms will be furnished to the Internal Revenue Service. Employees, officers and directors of System Pavers, its affiliates, subsidiaries, co-branded partners, consultants, contractors, advertising, public relations, promotion, fulfillment and marketing agencies, their immediate families (and those living in their household) are not eligible to participate in the promotion. You do not have to be a System Pavers customer to be eligible for this program. Only one referral per project. If a referral completes an additional project, it is not counted as a new referral. System Pavers will verify status regarding referral. 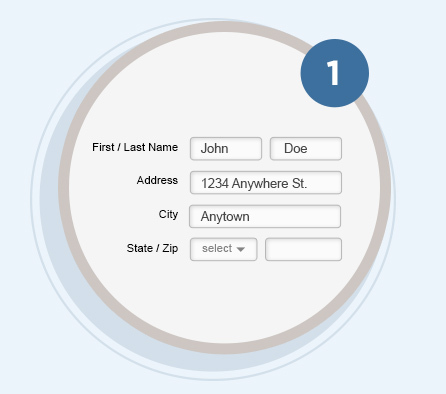 For example, if the person’s name and address is already in System Paver’s system, that person won’t be considered a new referral. The referral must be newly entered into the system as your referral prior to the first appointment. The referral must meet with a System Pavers design consultant within 30 days of referral to qualify. A referred homeowner cannot be considered as a customer until their System Pavers project has been completed – with at least a $2,500 purchase price, within a year of being referred to System Pavers. If two or more people refer the same new customer to System Pavers, System Pavers will determine who referred the customer first. It must be perfectly clear to System Pavers that a customer is actually a referral from you prior to their first appointment and not from a different lead source (i.e TV, radio, newspaper, event, etc). A referred customer must state they are a referral prior to their appointment. The customer must state you referred them. You cannot call System Pavers claiming a person already in the system is your referral. The $500 check will be cut in the primary referrer’s name. Referral entries that are lost, late, illegible or incomplete for any reason will not be eligible, and System Pavers reserves the right to modify, suspend or terminate this promotion at any time, without notice, and to disqualify any entry in good faith. System Pavers has the right to verify and disclose referral/referee information to the associated parties involved. System Pavers can choose to pay a Referrer their referral fee by applying the money against any balance due under a contract the Referrer may have entered into with System Pavers. Official Rules and Regulations for System Pavers 2015 $10,000 cash prize drawing. No purchase is necessary to win. A purchase will not increase your chances of winning. The sponsor of this sweepstakes is System Pavers Marketing Inc. (“SPMI”). SPMI will hold one random drawing in which one lucky winner will win a $10,000 cash prize. SPMI reserves the right at its sole discretion to suspend, modify or terminate this promotion without notice at any time. Participation may be limited. Void where prohibited by law, rule or regulation. How to Enter: You will automatically receive one entry into the drawing if you provide SPMI with a qualified* referral ("Referral") that results in an in-home consultation with an SPMI Representative. The Referral must participate in the consultation, which may take up to 90 minutes and must take place between the Promotion Dates (as defined below). Upon completion of the consultation, you will automatically be entered into the drawing. You may earn multiple entries into the drawing by providing multiple Referrals. Each qualified Referral will earn you one entry into the drawing. *A qualified Referral is a person who is a legal resident of the state of California, Colorado, Oregon or Washington, 18 years and older, and owns a single family residence where the SPMI representative conducts the appointment. Property in discussion must be located in: California: Specifically including and limited to: San Diego, Imperial, Riverside, San Bernardino, Orange, Los Angeles, Ventura, Kern, San Luis Obispo, Santa Barbara, Contra Costa, Alameda, Marin, Monterey, Napa, San Benito, San Francisco, San Mateo, Santa Clara, Santa Cruz, Sonoma, Amador, Calaveras, El Dorado, Nevada, Placer, Sacramento, San Joaquin, Solano, Stanislaus, Sutter, Tuolumne, Yolo; In Colorado: Adams, Arapahoe, Boulder, Broomfield, Denver, Douglas, Jefferson; In Oregon: Clackamas, Marion, Multnomah, Polk; and in Washington: Clark, King, Kitsap, Pierce, Snohomish. You and Referral cannot reside in the same home. All Terms and Conditions for the System Pavers Referral $500 Program apply to this sweepstakes as well. Eligibility: This promotion is open to legal residents of the state of California, Colorado, Oregon or Washington only. Promotion Dates: Referral promotion begins April 1, 2015 and ends December 31, 2015. To be eligible for the drawing, all consultations must take place between the Promotion Dates. Winner will be selected by random drawing on or around January 15, 2016, from all of the eligible entries received by the qualifying time period. SPMI is not responsible for any illegible, misplaced, damaged, incomplete or late entries. Prize: The winner of the drawing will receive $10,000 in cash. ALL FEDERAL, STATE AND LOCAL TAXES ASSOCIATED WITH THE RECEIPT OR USE OF THE PRIZE ARE THE FULL RESPONSIBILITY OF THE WINNER. Winner should consult their tax adviser with respect to any applicable taxes relating to the prize. Winner agrees to supply SPMI with any information necessary for tax reporting purposes and to cooperate in fulfilling all applicable legal requirements. See www.systempavers.com/myreferral for more details, terms and conditions. Winner: The winner will be notified by phone or email on or around January 20, 2016. In addition, the potential winner will be required to submit an Affidavit of Eligibility (including social security number) and Liability/Publicity Release in order to claim his/her prize. If a potential winner cannot be contacted, fails to accept his/her prize within three (3) days after selection, or fails to sign and return the Affidavit of Eligibility, Liability/Publicity Release within the required time period, that potential winner forfeits prize, and prize forfeited may be awarded to an alternate winner. Potential winner must continue to comply with all terms and conditions of these Official Rules; winning is contingent upon fulfilling all requirements. In the event that a potential winner is disqualified for any reason, SPMI will award the applicable prize to an alternate winner by random drawing from among all remaining eligible entries. Acceptance or use of the prize constitutes permission for SPMI and its affiliates to use winner's name, likeness, photograph, voice, opinions, and/or biographical information for advertising, publicity and other promotional purposes in any media, whether now known or hereafter developed, throughout the world in perpetuity, without compensation, unless otherwise prohibited by law. Nothing shall obligate SPMI to so use or engage in any of the above. The name of the winner may be obtained by sending a self-addressed, stamped envelope to SPMI within 90 days following the drawing and including a request for the winner's name. Odds: The odds of winning are determined by the number of entries received prior to the time of the prize drawing, and increase based on number of referrals generated per applicant. CONDITIONS AND LIMITATIONS: By entering, entrants agree to these Official Rules and all decisions of SPMI will be final and binding. This promotion is subject to all applicable federal, state and local laws and regulations. SPMI and its agents, affiliates and advertising and promotion agencies (a) make no warranty, guaranty or representation of any kind outside those written in these Official Rules, (b) disclaim any implied warranty; and (c) are not in any way responsible or liable for damage, loss or injury resulting from acceptance and use of a prize or travel in connection therewith. Winner assumes liability for injuries or damages of any kind caused or claimed to be caused by participating in the promotion, or by the acceptance, possession or use of any prize. By entering, all entrants agree to release, indemnify and hold harmless SPMI and its affiliates, co-branded partners, subsidiaries, retailers, agencies and their respective officers, directors, employees and agents, from any claim, injury, damage, liability or loss that may occur, directly or indirectly, in whole or in part, from the participation in this promotion . SPMI reserves the right, at its sole discretion, to cancel/suspend/modify the promotion if it becomes corrupted in any manner such that it cannot be conducted as originally planned and, in such event, to select winners from all eligible entries received prior to and/or after (if appropriate) the action taken by SPMI. ANY ATTEMPT BY ANY PERSON TO DELIBERATELY DAMAGE OR TAMPER WITH THE ENTRY SYSTEM, OR UNDERMINE THE LEGITIMATE OPERATION OF THE DRAWING IS IN VIOLATION OF CRIMINAL AND CIVIL LAWS AND IF SUCH AN ATTEMPT BE MADE, SPMI RESERVES THE RIGHT TO SEEK REMEDIES AND DAMAGES FROM ANY SUCH PERSON TO THE FULLEST EXTENT PERMITTED BY LAW, INCLUDING CRIMINAL PROSECUTION. SPMI is not responsible for any typographical or other error in the printing, the offering or the announcement of any prizes/offers or in the administration of this promotion. This Sweepstakes and these Official Rules will be governed by and construed in accordance with the laws of the State of California without giving effect to any choice of law or conflict of law rules (whether of the State of California or any other jurisdiction) which would cause the application of the laws of any jurisdiction other than the State of California.